A week or so ago, a report came out via Recode that Facebook is no longer the top site for referral traffic, Google has overtaken them to reclaim that as the top site in that category again. Parse.ly, the data source, said in January, Facebook provided nearly 40 percent of publishers’ external traffic; now that’s down to 26 percent. And Google, which started the year at 34 percent, now generates 44 percent of traffic. Google's corporate communication rep, Maggie Shiels posted it on Twitter saying "Google is sending more traffic than Facebook to publishers - again." 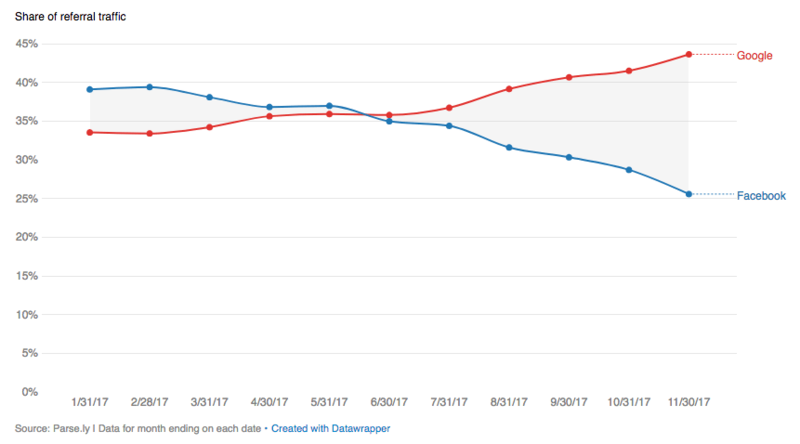 One of the reasons for the change is that Google AMP is sending more traffic while Facebook Instant Articles is sending less now.